I told you that last week, I got to moderate a panel featuring the team that created Virtual Alabama. That event was held at DC’s Googleplex right downtown. Let me tell you that this is nothing like my office. My favorite, of course, were those big balls that you see at the gym — all in Google colors, of course. 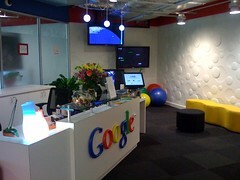 Last month, the WP reported that Google was opening a federal sales office in Reston, VA.